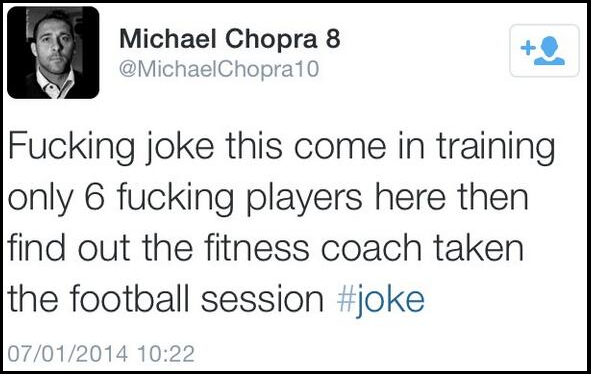 That’s right, Chopra took to Twitter to brand Blackpool’s training regimen a “f**king joke” after turning up to find just six players in attendance for today’s session, with manager Paul Ince also obviously absent as the session was taken by one of the Tangerines’ fitness coaches. Who’d have thunk it, eh? A club run by Paul Ince ever being described as a “f**king joke”? It beggars belief. It’s a shame that players don’t feel they are able to complain about perfectly valid concerns. Surely it’s right to expect some sort of standards from these institutions?? He certainly could’ve worded his discontent better but that doesn’t change the facts that other players and the coach don’t take their jobs seriously.